Why cede so much ground to the right? Why permit Fox News and other conservative media to target white men as their main, sometimes sole, audience? Not only are self-identified white men an extremely large political bloc, they are far from monolithic in their political leanings. Even though 60 percent of white men voted Republican in the midterm elections this year, that still leaves tens of millions of white men who voted Democrat, independent, or not at all. Moreover, a significant portion of that 60 percent could be convinced to support parties and candidates that better promote their interests if more were done to appeal to those interests — to target white men directly as a distinct voting bloc. 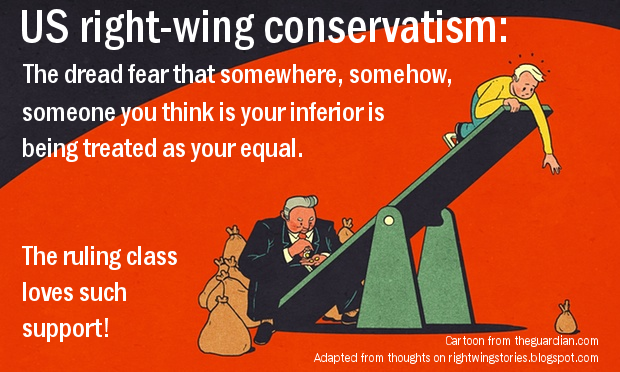 Conservative pundits and politicians use fear as a tool for encouraging white men to vote Republican: fear of immigrants, fear of unemployment, fear of feminists, fear of ISIS, fear of Antifa, and so on. Ambitious Republican politicians and operatives then use the same fear to move the party further to the right by undermining moderate voices. While the use of fear to manipulate is an insult to both the intelligence and values of many white men, it is often a winning strategy. In fact the ‘conservative’ label itself is seemingly born out of fear: Researchers have determined that conservatives can be transformed into liberals if the perception of physical danger is eliminated. The opposition should not grant Trump this psychological victory. There are many pathways to white male hearts and minds that are not paved by fear. White men care about many of the same things women, transgender folks, and people of color do. They care about health care, jobs, social mobility, the environment, education, and future generations. They are doctors, lawyers, teachers, scientists, sanitation workers, salesmen, and students. They may not feel economic and social regression as deeply as less privileged groups do, but they feel it nonetheless. What if a few more downtrodden white men in Georgia, Florida, or Mississippi had voted blue in those tightly contested races? What if they had chosen to be taken in by the opportunity for progressive change rather than by the fear of that change?